Before writing in with any of these questions, please get your bird to a certified avian vet ASAP. 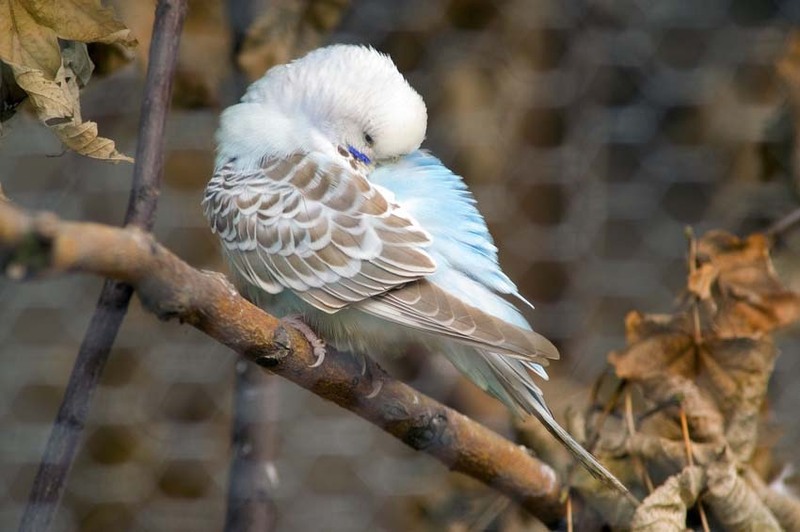 Budgies are prey animals, which means they have learned to hide illness very well. By the time they are showing signs of illness such as those listed above (or generally just acting different than normal) - they could be very sick and will need medical attention immediately. You can find a certified avian vet in your area here: Avian Vets International Directory. 2. Can I have a budgie even if I have a cat and/or dog or other pet? Yes, but for the safety of your bird, I would keep them separated - such as keeping the bird in its own room that the other animals aren't allowed access to. We keep our birds upstairs in their own "bird room" and the cats are only allowed downstairs. Cat saliva is toxic for budgies. I have heard too many horror stories of people's birds being eaten by their cats and dogs. It has happened to even the best and most cautious of owners. I just don't think it's worth the risk. 3. Are they easy pets to look after and keep? They are higher maintenance than a dog or a cat. You need to give them plenty of out of cage time every day, lots of human interaction. Provide them with plenty of fresh food and water every day, lots of new toys, etc. Their vet bills are much higher as they require a certified avian vet which is much rarer than a general vet that will see cats and dogs. They are also much more fragile than a dog or cat and will require that your household not use any fragranced items like soaps, strong cleaners, perfume, scented candles, air freshener, and teflon. Birds lungs are very fragile. You also have to ensure that their minds are kept stimulated so they don't turn to destructive behaviours - plucking, screaming, destroying furniture. Also, make sure they don't get hormonal. We have spent well over $6,000 in vet bills on our budgie Skye alone because of her egg-binding issues. This size budgie cage is smallest I would recommend for one to two birds. Remember horizontal width is more important than height as birds fly horizontally. The cage bars are narrow enough so that their heads can't get caught between the bars and there are horizontal bars for climbing. The cage is powder-coated and not made from toxic metals such as zinc, nickle, or brass. Dr Harvey's Best Budgie food comes highly recommended. Tons of great nutrition, vitamins and minerals that you don't find in regular petstore budgie seed. Note the main ingredients are NOT millet and oat groats! Yay! Also supplement this with pellets and fresh fruits & veggies. These cuttlebone holders are great. I have one in each cage. The budgies like to sit on them to eat their cuttlebone and they aren't sharp and don't get rusty like the little metal holders. They last FOREVER. Cuttlebone plus mineral block -all in one! What could be better? They LOVE that pink mineral block. Skye turns into a pink-headed budgie when she starts going on that one. These are the BEST food/water dispensers. Budgie's can't poop in their food or water and make themselves sick! Budgie swing! You want one big enough for a couple budgies so they can turn around on it. Without alot of foofoo threads and stuff that will scare them or potentially catch a toenail and lead to injury. They love the colorful wood beads and it's even better if there is a bell they can talk to or wear as a hat. Budgies LOVE their swings. Provide several different kinds. Make sure not to place them over food/water bowls. 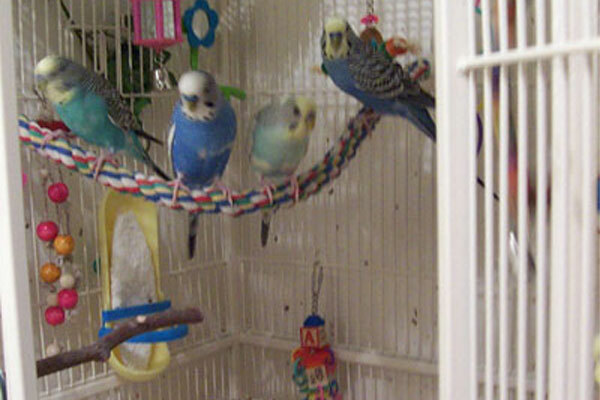 Budgies need several perches in the cage. 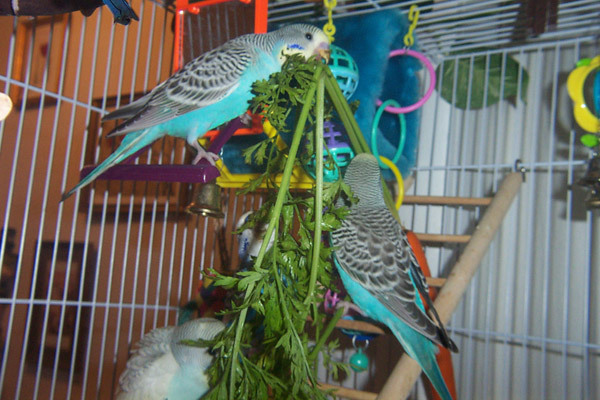 Make sure to get different sizes and diameter of branches to exercise your budgies toes and feet. Place them at different heights. I like the ones with multiple branches. Get big ones, small ones, medium size ones. Avoid sand perches - these can hurt their delicate feet! It's important to also provide a soft rope perch. Get one that will fit the length of the cage. Don't place it in the cage so high that budgie's can reach the roof of the cage to bite other guy's feet. Keep any threads trimmed off so they can't tangle in little claws. 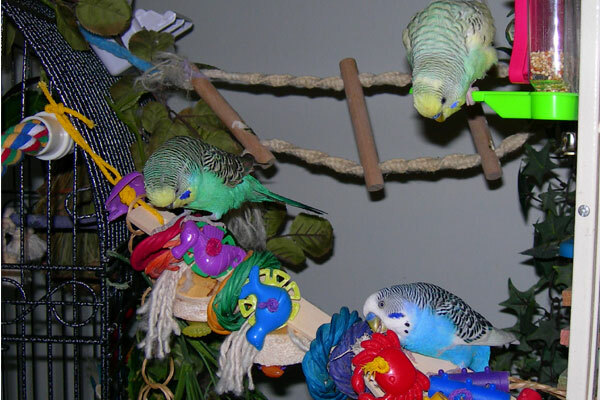 Budgies need lots of different kinds of toys for mental stimulation and play. 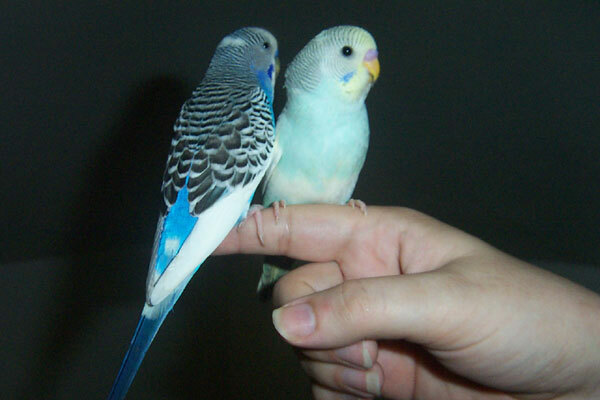 Over time you'll learn the particular favorites of your own budgie. Then you can go to the folks at BirdyBooty who will custom make toys just for your little guys perferences! Here are some perennial budgie favorites: Sheredding toys, boings, ladders, swings, bells, things they can throw or bang around or carry in their beaks. Budgies love to bang this against the cage bars and try to kill the bell. Thread these through the cage bars and watch your budgies go to town chewing them up! Better this than gramma's armoire or the windowsill, eh? Hide treats in the buckets for foraging fun then let your little ones teach you how to play fetch! They throw the bucket and you bring it back to them! Yay! Same as above: Hide treats in the buckets for foraging fun then let your little ones teach you how to play fetch! They throw the bucket and you bring it back to them! Yay! PLUS: they can admire themselves in the mirror and imagine what they would look like if they were a flower. My Skye likes to give the mirror kisses and spin the flower. Who's that handsome budgie in the mirror? Budgie's love to chat up a storm to the hottie in the mirror! With a new budgie to train, you'll need ALOT of millet. Save some serious ca$h and buy organic IN BULK! Budgies love ladders! Buy the bigger ones so they can weave in and out of the rungs and play tag. Big beautiful photos of budgies!